October 2006. 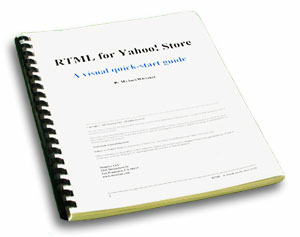 This guide has not been updated for Yahoo Store Editor V3.0 and RTML 2.0. If you have opened a new Yahoo! Store in October 2006 or have upgraded your Store via the Design Wizard, then this guide may not be for you as the screenshots have changed. Yahoo! Store is a powerful e-commerce platform for small businesses. Business owners can set up a virtual store and be selling their products and services online in minutes. The standard templates provide an easy way to build the store without requiring programming skills, while providing very powerful backend tools. However, if you want to achieve a truly unique storefront you need to know about RTML - the programming language of the Yahoo! Store system. Using our experience with the Yahoo! Store system, we put together this introductory guide, which contains valuable tips and tricks for other Yahoo! Store owners. We hope that it will form the basis for you to explore many other ways of modifying your store. People who want to build a better storefront by going beyond the standard features of the Yahoo! Store system. People with a good knowledge of HTML and the regular editor, but who are not full-time Yahoo! Store developers. Small business owners who may want to implement a few changes, but who cannot justify the expense of hiring a consultant. Modifying templates is pretty straightforward once you have the hang of it; however, you must be prepared to put in time and effort to learn it. Learning to use the template editor. Using your own "add to cart" image. Putting a search field in the navigation bar. The focus is on learning by examples - showing you how to read and modify the relevant templates rather than going through the theory behind RTML. In most real-life cases you will be editing templates instead of creating new ones from scratch, and you won't need to know about all RTML expressions. A deep theoretical analysis of the RTML language. Yahoo! Store is intended to allow small business owners to get into e-commerce without requiring outside help, so the emphasis is on providing easy-to-follow examples. Information on other aspects of Yahoo Store, such as credit card processing or tax calculations. The existing Yahoo! Store help files cover those well enough. Every imaginable worked example. Every website has different requirements, and it is hoped that this book will provide you with enough of an understanding of templates so that you can do your own template modifications to suit your particular needs. RTML for Yahoo! Store is written by Michael Whitaker of Monitus, LLC. Please contact him directly with questions regarding this book. SPECIAL NOTE: When you purchase this e-book bundle, on the order confirmation page you will see a red button next to this product. You will need to click that button to retrieve your e-books. Electronic publications are not shipped. very good information,but just a few more examples needed.